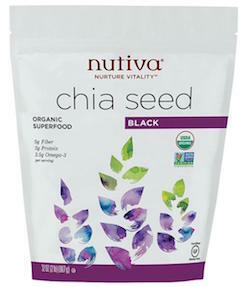 Nutiva Raw Organic Chia Seeds 2 lbs. These mighty, gluten-free seeds, packed with omega-3, protein, rare antioxidants and fiber, are making a strong comeback in the 21st century. Enjoy them in yogurt, oatmeal, baked goods or smoothies.